My name is Dickie Jo Kubas and I live in South Heart with my amazing husband and a variety of pets (2 dogs, cats, birds, fish, and, when she’s not at school, a sugar glider)! I am currently teaching for Billings County School District at Prairie School in Fairfield. I have 8 wonderful third and fourth graders in my home room, along with teaching them math. I also enjoy teaching math to my 8 fifth and sixth graders, and 9 seventh and eighth graders. Late last summer I was informed that one of my students was in the Fargo hospital and would not be at the Back to School Open House. Besides dealing with West Nile, my 4th grade student, Ian, was also diagnosed with a brain tumor. 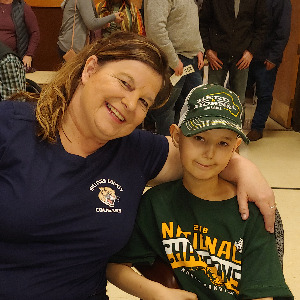 At 9 years old, this brave little guy has already had 3 brain surgeries in Fargo, 6 weeks of radiation and chemo at Mayo in Rochester, and has completed his second of 6 rounds of chemo in Fargo and Bismarck. If his treatment stays on schedule, Ian should receive his last chemo in July. Through all of this, Ian has remained remarkably brave and strong. He misses as little school as possible and brightens the room with his smile.  I am going to participate in the 2019 Brave the Shave in honor of my bud, Ian. I greatly appreciate all those who contribute with donations and/or prayers! What a gracious thing you’re doing for a wonderful cause!! A challenge goes out to all other Lions members and clubs! Help support this event to aid families dealing with pediatric cancer. Thank you for all the community volunteer work you do !